Sean Tomás Beag, Barnt Green’s Quakerwarden, offers some answers to the big question. Dear Editor: Hi pal – remember me! Ages ago you published an article about Quakers in Barnt Green and you very kindly allowed this Quakerman to speak in the vernacular. You know – speaking in the love of the common people; the common touch. Quakers are a no-frills people, so allow me again to speak without frill. What has prompted this tome is simple. It has happened again. A stranger entered my yard. He asked two questions that had me flummoxed. Question number one: Quakers in Barnt Green – how come? Question number two – Is Barnt Green Christian? Of course I invited the stranger in. Come in, says I. Have a cup, why don’t you… and together we attempted to answer the two questions. Methinks our village people might like to listen in to what was said. I began, wisely, with question number one. There has been a Quaker presence in Barnt Green for a hundred years, and please God we will still be here for hundreds of years to come. As is my wont, I told my new friend the story. A hundred years ago a Quakerman by the name of John Gibbins lived with his young family in a big house up on Shepley Road, Barnt Green. Being Quaker, he let his life speak. It is what he done, not what he said. At that time the nearest Quaker Meeting House was downhill in Longbridge. So each Sunday see John harness his horse to the family trap, load his family on board and set off to meeting for worship at 10.30am in Longbridge. His family got bigger, his horse grew older, but those darn hills stayed the same: steep. So John put his horse to grass and he bought land in Barnt Green village. Right smack-bang-wallop in the middle of the village. A village newly connected by rail to the city. A village that will grow and people will be all the better for having Quakers in their midst. Friend Gibbins built a prefab in the style of a tin tabernacle and for years it was the hub of village life. Once a school, at times a band room. A place to meet. In the late 1960s the tabernacle was replaced by the present structure. For many years it was our village hall, but always on Sunday – on the first day – we, us Quakers, met at 10.30hrs to worship. We meet every Sunday to worship God. No bells, no smells, no frills… no big deal. We let our lives speak. We meet in silence to listen and to try to discern the will of God. Thy will be done. We listen to what God might require. What does love require of us. I figure Cadbury, Harris, Gibbins – I figure all good people get to listen to the still small voice that said to Cadbury: Build a Bournville village… said to Gibbins: Buy and Build in Barnt Green – you catch my drift! Now, my friend, this other question you ask me. Are we Christian? Friend, I have said all of the above. I have said all of that so I can say all of this. I love the philosophy of Jesus. The no-nonsense approach of the teacher. Listen… give to Caesar what is Caesar’s, i.e. pay your tax. When asked what is the trick to being happy? Listen… do not do what you hate doing and do not tell lies. When asked who is the greatest in the kingdom, he called a child to him and he said: Listen… unless you believe like she believes, with all your heart and soul, you will not enter the kingdom of Heaven, i.e. try to tell the children about God and they will give you the look that they reserve for idiots. Children are still connected. Waste your time teaching children what they already know. This is what I tell my children. Let me first explain that I am an old man… my children are all grown and flown, but it is well I remember their disappointment in discovering that the tooth fairy was Mum all along and that Father Christmas was really Dad. So I had to go gentle. Do you follow? Once upon a very long time ago, when all the world was new and even before the gods had names, all these new gods were sitting around having a chat and Man entered the conversation and he said: Me! I too am God. The others weighed up his claim and they all agreed. But to save him from himself, to save him from vanity, the god who was wise said: Listen… let us take his godhead and hide it. Good idea. So he took Man’s godhead in his hand and hid the light… but said: If we hide it on earth he will leave no stone unturned in his search for it – such is the determination of Man. And, if we hide it in the heavens, he will search among the stars. I know! said the wise god, I will hide it where he will never think of looking. I will hide it inside of him. Yes – I believe God is love and when you journey/search inside of yourself, looking for love, you become love. Oh! I see. And I believe she did. Am I right? Are we Christian? What is right! What is righteousness? The method and reasonableness of Jesus. Quaker John Gibbins was a good man. He put the clock in the church in Bromsgrove. 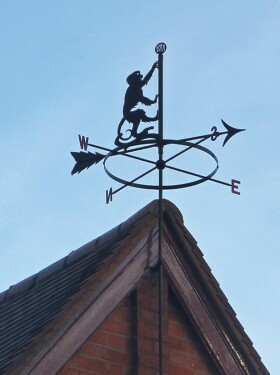 If you look carefully at the weather vane on Blackwell School in St Catherine’s Road (right), you will see the shape of an ape which he cut to symbolise Apesdale; he personally made and erected the whole thing when he was a governor at the school. Quakers have a way. Keep it simple. K.I.S.S. But Daddy, keep it simple… what about the second S? My dear, the second S is silent, that is why we call it the Quaker Kiss. The philosophy of Jesus is simple. above all, take the eleventh. The 11th Commandment: Love one another. How difficult can it be. When children prepare for bed, saying their prayers is like a captain posting his sentries – after that he may sleep. Goodnight. No more but my love.